How to spread roof load evenly over a box beam? Hi all, a novice here. 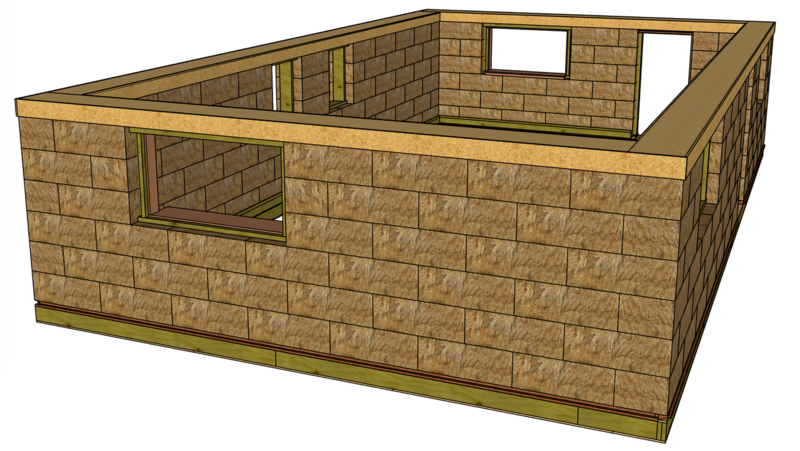 I'm currently designing a timber frame roof (roof only) to sit atop a single-storey load bearing straw bale wall design. The straw bale walls are made of six courses of bales and are sandwiched between two box beams. The walls are built and then the timber frame roof will be lowered on top of the walls by a crane. So, I need to ensure that the roof is lowered onto the center of the box beam so that the load is evenly distributed across its length. This then compresses the straw bales below safely. I'm not sure what the most eloquent solution for this problem would be. Clearly, one option is just to stuff a 6" deep piece of timber between the tie-beam and the box beam below. But, this is a lot of timber for a relatively simple job. Maybe I should place noggins every few feet under the tie-beam? Or there might be a proper timber-framing solution to this? Or, perhaps I'm worried about a non-problem? Since the box beam can be considered as a single piece, perhaps it's okay to have this gap? Any advice would be appreciated. As mentioned above, I'm a novice, so it's entirely possible I've missed something obvious. Re: How to spread roof load evenly over a box beam? I think you could add filler blocks in; spaced evenly would accomplish a more even loading. It looks like your box beam is wide enough, that you could half lap both the top plate/beam, and the joist, and still have the full thickness on top of the box beam. I don't believe your plate is going to uniformly distribute the timberframe roof load to the box beams along the length much less the gables. If this is still in the design stage I'd put posts under the trusses to carry those point loads down to the foundation and use the strawbale as non loadbearing infill. I'd also run the purlins normal to the top chord, rotating them ~45 degrees. Do check the offset bearing on the bottom chord/plate, there is a lot of load there. 1) If I just half lap the tie beam and wall plate to bring the tie beam down to meet the gable end wall, won't this cause problems with cantilever due to the overhang (jetty)? 2) We are going for a load bearing straw bale design as we cannot afford an entire timber frame. Framing just the roof is a compromise. 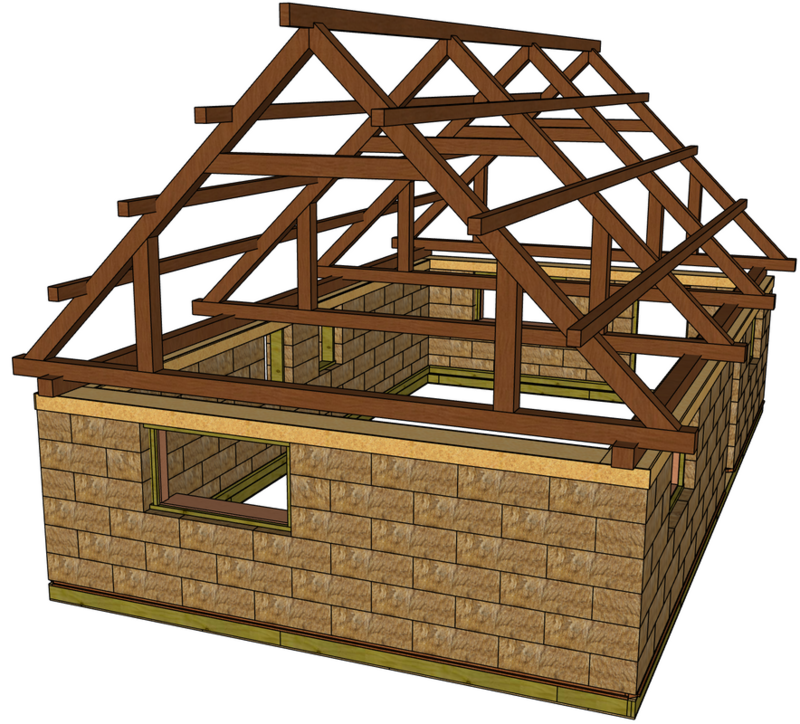 Is anyone aware of examples of a timber framed roof on load bearing straw bale walls? Is there some way to ensure even loading of the roof on the box beam below? Possibly one option is just to ensure that the box beam is strong enough to take the extra weight under the bents..? 3) What would be the reason to rotate the purlins by 45°? I had understood that the current arrangement was preferable as although it's a little extra work to cut, it prevents dust from gathering on the purlins when the house is in use. I'm just throwing ideas out there to think about. 1) I wouldn't do that. Look at the roofs of cathedrals on masonry walls for how they crossed thick walls. "Open Timber Roofs of The Middle Ages" has good drawings and descriptions. Online some of Cecil Hewett's drawings are probably out there. Look at how they transferred the loading over the wall in the heel area. 2)I'm thinking the 8 posts wouldn't use much or any more timber than the box beam and would provide an easily defined vertical load path. The question in my mind, and I have no idea what the answer is, what is the load bearing capacity of the strawbale wall? What I'm envisioning with the current drawing is the plate and box beam sagging under the load over time and cracking the render over the bales, then admitting moisture. A slow progressive collapse. I'm sure there is some point of stiffness where the load is applied uniformly enough to prevent this. You're in engineer territory. If there is a post under each truss the structure has a definite support under each point of concentrated load. If there is later trouble with the strawbale the structure is still intact. The post doesn't necessarily need to be wood but that would probably be the most affordable, easiest to construct and least likely to condense. Alternatively if the spacing of the bearing members above is closer the box beam and plate don't need to be as large and stiff to transfer the load uniformly. You mention needing more room upstairs. Are the upper floor joists resting on the box beam or the bottom chord of the trusses? One helps distribute uniform load the other increase the point load on the box beam. 3) Ease of assembly and lack of notching bearing members is what I was thinking. Your top surface is collecting dust as drawn. I suppose a parallelogram would solve both. You need one at the bottom of the run in the drawing as well. I would take Don P's advise. Ditto DonP’s advice. A 6x6 on top of the box beams will not do a good job of distributing the load all the way across the bales. Instead it will deflect more under the rafters, causing those bales to compress when they take more weight. Simply adding a few posts - even if they are on the inside of the straw bales - will most likely be the lowest cost solution. If you do that you won’t need the 6x6’s across the box beam, and the wood savings from eliminating the horizontal 6x6’s will most likely offset the amount of wood needed for the posts. You’ll need to put some short pieces between the top and bottom chords of your trusses in order to carry the load from the posts up to the top chord. Having said all this, if DonP advises something different I’d follow his advise. I would also go with Don suggestion to put some posts. I know there is some design where the straw bales are load bearing. That design always freak me out. What about a water infiltration ? I know straw bale house never have water infiltration… But what if, and if that if is not seen rapidly ? At least if you have post the renovation will be much more simply. We see that quite often on old house that the inside wall has to be strip leaving only the structure. If you dont want to put up a total post and beam, you could cast some ciment post tied with the footing and the box beam with some rebar in. The box beam could be as big and strong as you want. Another advantage of a post system is that you could put your roof on before the straw so that you are not in a rush to protect your wall from rain. I've seen 2 houses around my place that are scrap because the rain touched the straw, high wind , the tarp flew away and bang ! I have baled and stacked ten's of thousand's of straw and hay bales and I wouldn't have them holding up the roof of anything I was sleeping in. Go with what Don P suggestion's so you won't be sorry latter. Over the years I have rebuilt a lot of building, barns ,houses that folks saved money on lumber, concrete and so on. It's better to do it right from the start. Reminds me of the parable of building the house on the sand! Better use timbers to set things on, or rock! I am curious about building with bales. Is this a method that has been used, or an experiment? Reminds me of the 3 little pigs fairy tail. Ok so I read a Wikipedia article on it and it has been done, but in snow regions, it usually has a frame or substructure, and the bales act as sheathing and insulation. Kinda like wattle and daub. Making Sawdust, boards and signs. Ford Ranger, Mac 610 24", other chainsaws 14 to 20"
Page created in 1.778 seconds with 40 queries.